When I was young, the idea that I would be able to sit down for long periods of time and create something quite beautiful would have never entered my mind. I lacked focus and concentration and was not very good at sitting still. When I became an Iyawo (Iyawo signifies “Bride of the Orisha” and it is the year that follows an Initiation as a Priest in the Lucumi tradition), the strict taboos bestowed on me inspired me to find things to fill my time and I was keen to find things Orisha inspired. Beading and making Elekes and Ides became an obvious choice. It was therapy, meditation and creativity all rolled into one. My eye for colour and beautiful beads was inspired and I was amazed to find in England that there is quite a tradition of beading and bead fairs selling all manner of beautiful beads all year long. The Science of making Elekes is complicated. 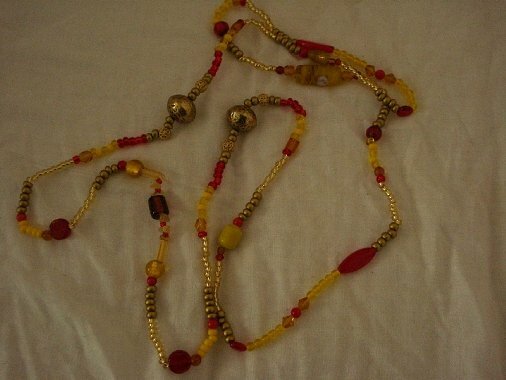 Each Orisha has it’s number of beads, colour and variation on colour with every path of Orisha. There are also regional and house distinctions and also Elekes that represent Odu. ( system of adivination). When I was an Iyawo. I became a factory of Ides and Elekes, I also started beading anything that did not move! I begun to receive commissions and did quite a few, but since then other things have taken over and I made a conscious decision not to dedicate myself to making Elekes and Ides to sell but to make only for Ocha family and godchildren and also my Orisha. Since I wanted it always to be a labour of love. I didn’t want to end up resenting making them or making them to a deadline in a hurry. I have decided although I have seen so many beautiful Mazos for the Orisha that even if it takes time, I would like to be the one to make them for my own Orisha. I still enjoy beading and find it therapeutic. I make them in silence in my Ocha room and pray and count as I go. I have made all of the ones received from my godaughters and am proud that they were not bought on line or from a Botanica. 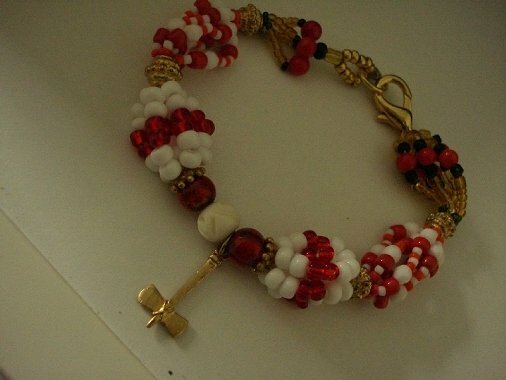 Ides are what Santeros ( Iyalorisha/babalorisha or Olorisha) wear on their left wrist. It identifies who they are crowned with and also acts as a protection. 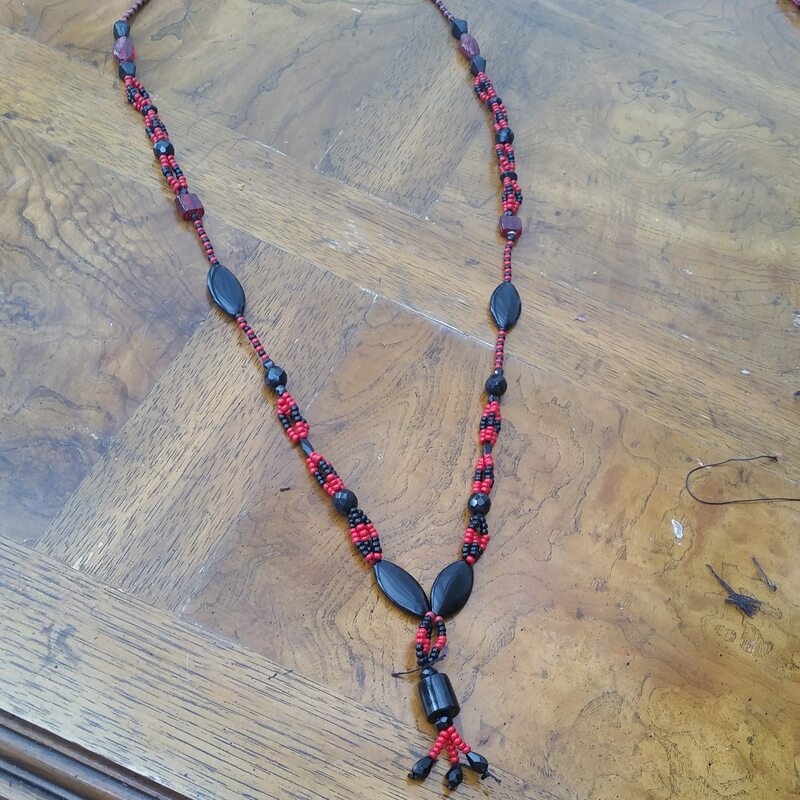 A Mazo is a large many stranded necklace. I have also made beaded nets for my Orisha. 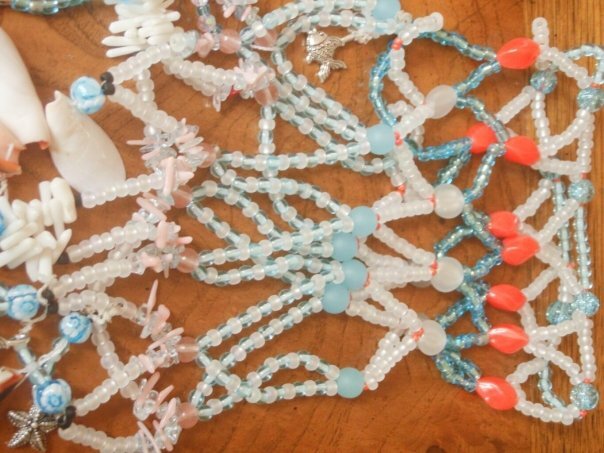 Beading is very much part of our artistic tradition. Not all Santeros are going to find that they have time or inclination to make their own Mazos for Orisha or Elekes and Ides, not everyone is blessed with the same skills. And so it is great to have such talented people in the community. Here are some sites to check out. Connecting to the elements; a Santera’s guide to London. Where is a good place to find the patterns for individual orisha? I know that different houses use different patterns sometimes, and that different roads have different materials and patterns. Asking your elders, I think would be a good start. Different Roads have different patterns and carry different kinds of beads. There are differences between houses also, and some paths and their variations are more well known than others. If you have any particular questions I can answer in a private message. Thanks for writing Katherine. I would say in any case, don’t use plastic beads!